High-end Quadras and Power Macs had a proprietary Apple Attachment Unit Interface (AAUI), which allowed the use of various ethernet dongles, a marked improvement over the old days of PhoneNet and LocalTalk. However, for midrange Performas and Power Macs aimed at the consumer market, there was the curious Apple Communication Slot. The “Comm Slot” first appeared in the Macintosh LC 575, an all-in-one that directly descended from the popular Macintosh LC. There were lots of upgrade options for the LC product line. However, the early “pizza boxes” only came with one slot, resulting in anguished decisions over whether to choose to put an Apple IIe or DOS compatibility card, a second monitor, an accelerator card, or network connectivity in that single LC PDS (Processor Direct Slot). This Apple / Global Village 56K modem was compatible with both Comm Slot I and II. With the addition of Apple’s proprietary Comm Slot in later models, a modem or ethernet card could be installed while leaving the LC PDS slot free. The Comm Slot resembles a standard notched PCI connector, but it is slightly shallower and has 4 fewer contact pins. However, it interfaced with the system through a 68030-based bus, regardless of the machine’s processor. 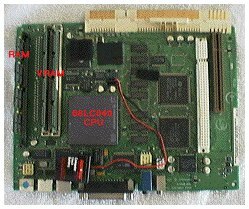 The LC 575 logic board was the first to sport a Comm Slot (at the upper right). 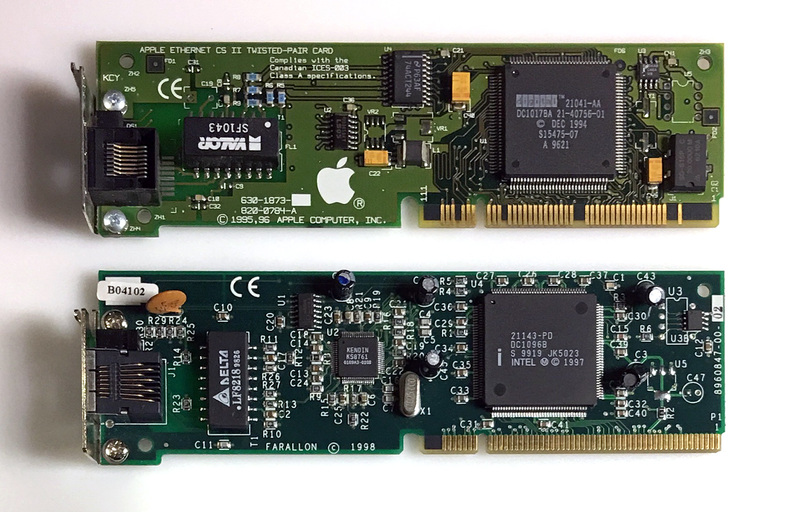 Comm Slot II ethernet cards with 10BASE-T from Apple (top) and 100BASE-TX from Farallon. With the advent of PCI-based Power Macs, the faster PCI bus allowed the bandwidth of the slot to be increased. The slot’s arrangement, including the small notch, was reversed to prevent a faster Comm Slot II card from being plugged into an older unsupported computer. A few backward-compatible modem cards were double-notched so that they could be used with both types of slots. * Note that adding a modem card to a Comm Slot (either type) will disable the Mini DIN-8 serial port (or Mini DIN-9 GeoPort) marked for an external modem. 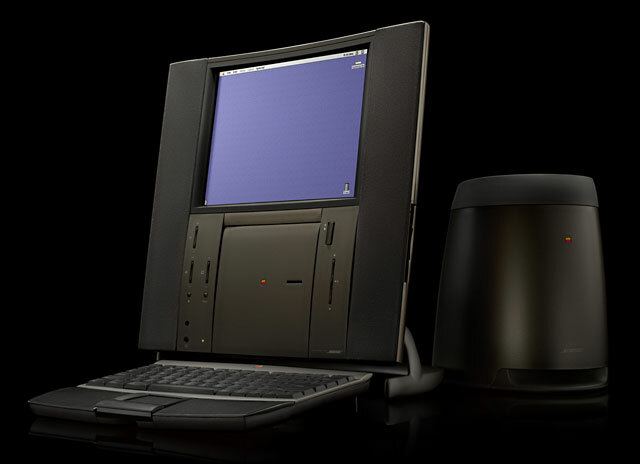 The TAM was the last Mac to be introduced with a Comm Slot II. The advantage of using cards supplied by Apple is that drivers and support are usually built into subsequent releases of Mac OS system software. The disadvantage is that the selection is limited, with ethernet support topping out at 10Mbps 10Base-T. Farallon produced a 100Mbps 100Base-TX card that took advantage of the faster speed of Comm Slot II, but it suffered from compatibility problems and became unstable when used with G3 processor upgrades (with the exception of Newer Technologies’ MAXpowr G3). The original iMac was launched with broadband connectivity built-in, no cards or dongles needed. Because Comm Slots were no longer needed with internet-ready Macs from the G3 era onward, the above cards are becoming increasingly difficult to find. For PCI-based Macs, PCI cards can be an easier option to track down for faster broadband connectivity. In fact, with a PCMCIA-to-PCI adapter, a wide range of WiFi cards normally intended for PowerBooks can also become a viable alternative.